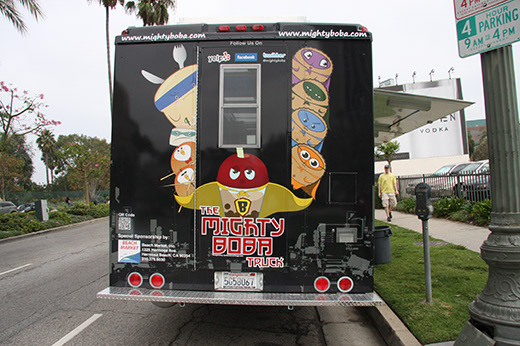 The Mighty Boba Truck is one of two boba-centric trucks currently on the road - the other is simply called The Boba Truck. Mighty Boba serves different flavored teas with tapioca pearls; it also features Taiwanese snack food such as boneless pork chop, popcorn chicken, and sausage. 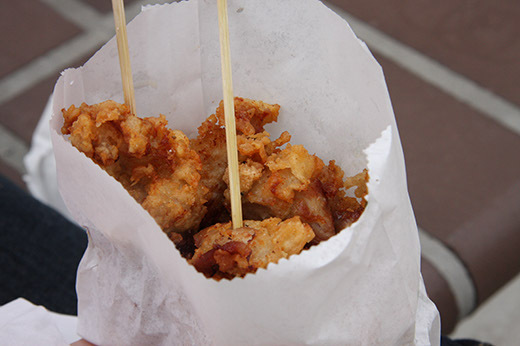 Their food's available in a snack-size portion ($4), or in a lunch box ($6), which also contains rice and veggies. I got a snack-size portion of the spicy buttermilk popcorn chicken. Small pieces of light and dark meat were coated in a tangy, slightly sweet breading that packed a bit of heat. Just two tiny complaints: the chicken was ever so slightly overdone, making the breading tough to bite through in places; and it could have used a pinch less salt. Otherwise, it was really tasty, and I ended up getting it again a few weeks after this first visit. 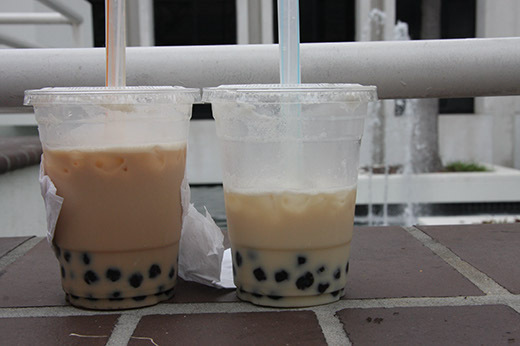 We got two boba teas ($4 each, plus $0.50 each for the boba): black milk tea and honey milk green tea. The boba were a tad smaller than what I've determined to be "standard" boba size. Like too-large matzo balls, big boba tend to be less flavorful, and their outside skins start to soften and slough off, creating a gelatinous muck on their surfaces. (Can you tell I've eaten quite a bit of boba in my time?) These smaller boba were chewy and tasty. They also zoomed up the big boba straw, meaning I pretty much had a perfectly sized mouthful of tapioca every time I took a sip of tea. 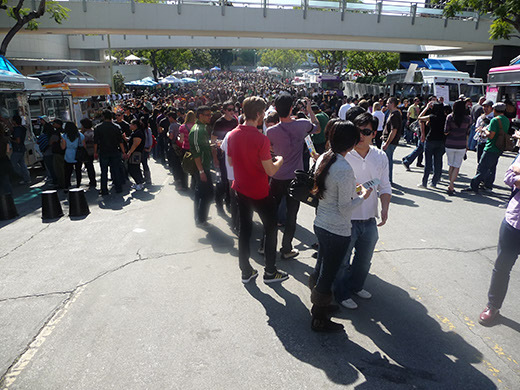 I could have drunk a gallon of the black milk tea. (It's a good thing I didn't, though, or I wouldn't have slept for the next three or four days.) So many boba places drown their black tea's flavor in milk and sugar, but here, the tea definitely kept its smoky aroma, even though it was surrounded by sweetness. This boba tea is higher-quality than the tea you'll find in a lot of boba joints, because it doesn't taste like someone made a giant vat of it; it tastes as if it was brewed just for you. The honey green milk tea was almost preposterously sweet. I loved it, but for those of you who prefer less sugar in your tea, the Mighty Boba Truck will make it how you like it - just ask. 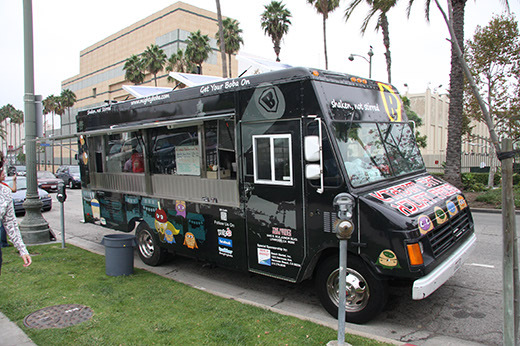 The truck doesn't have too many options for vegetarians, but then again, it is a snack-and-drink truck rather than a full-on meal-serving machine. On the day I visited the truck, there was one vegetarian choice on the menu: sweet potato fries with condensed milk ($4). Looking at the menu online, I see the truck also offers pan-fried tofu steak with a honey-soy sauce glaze. Since I'm a sucker for anything with condensed milk, I'm going to try the sweet potato fries on my next visit to the Mighty Boba Truck.